Whether you are travelling for business or pleasure – you can expect friendly hospitality and top quality at reasonable prices when staying with DAS REINISCH Hotel & Conferences****.Perfectly located in Vienna Schwechat Mannswoerth, on Vienna’s doorstep just 15km from the centre of Vienna, 4km from Vienna Intl Airport, and yet set in peaceful and very quiet surroundings.DAS REINISCH is situated on the edge of the expansive Danube-Auen National Park, which stretches from the region surrounding Vienna into Lower Austria.Newly adapted and air-conditioned seminar rooms with modern technology, free Wi-Fi and mobile partitions for up to 125 people and individual seminar support from our dedicated team with know-how, spirit and heart. 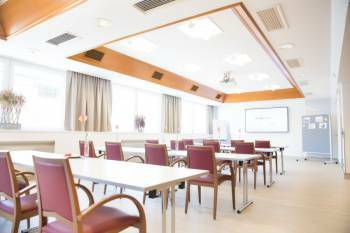 The seminar and function rooms all feature modern equipment, natural light, air conditioning and free WLAN Internet access!Whether it be a conference, workshop or event – the scope for a successful and attractively organized work meeting is large and more than flexible. 4 Function rooms (from 6 to 120 persons) with daylight and partly with air condition which can be connected and varied in size thanks mobile room partitions, offer plenty of space to fulfill your wishes when it comes to planning your individual event/congress/conference/workshop.All meeting rooms do offer FREE W-LAN Internet Access, day light, partly air conditioned and most modern seminar/conference technology.